My writing self is divided into two beings—Ms. Practical and Ms. Deep. Unfortunately, they aren’t getting along very well these days. Ms. Practical is bossy and overbearing by nature. I can’t really blame her—she has a business to run, with lots of deadlines to meet and bills to pay. She has learned what she needs to do to keep her head above water, and she’s relentless in her focus. Unfortunately, she has a way of silencing Ms. Deep in the process, acting as if all that introspective stuff certainly couldn’t be of any real consequence—not when there are Important Clients and Deadlines to attend to. In her pushiness, Ms. Practical manages to convince every last inch of my energies and creative thinking powers to join her side of the operation. My mind becomes an unbalanced longboat, with the entire crew working furiously on the left side, rowing us in mad circles. Ms. Deep stands on the shore, graciously waiting her turn, just as she always has. One day the bills will be paid, maybe the bank account will be cushioned. One day the kids will be grown—they won’t need to be driven to soccer and voice lessons, picked up from volleyball and helped with algebra. Ms. Deep knows her time to write will come, but it will come yoked to a sacrifice, a loss. It’s that knowledge of what will be lost that gives her patience. There are too many good and beautiful things about life right now to complain or demand her place in the sun. She watches while she waits, soaking in the stories, processing the ideas, capturing still images as the days speed by. And every so often, Ms. Deep gets to do her thing. Enough of the Important Deadlines are met, and Ms. Practical collapses for a while, leaving everyone else alone. A peace settles over the harried household that is my mind. Ms. Deep carves out a few hours to write on the front porch, to engage in an inspiring conversation with friends, to read and process ideas that might later emerge in new strings of typed words and sentences. Last summer there was even a mini writing retreat with Jen at her family’s lake house. An essay for the book Not Alone was finished, another chapter of my memoir project was written, and I even found the time and the words to describe why writing should be hard. Ms. Deep was completely in her element. And this summer, in June, I’m heading to the Glen East writing workshop for a week. In case you’re wondering, Ms. Practical is not invited. There simply won’t be room for her overbearing ways. 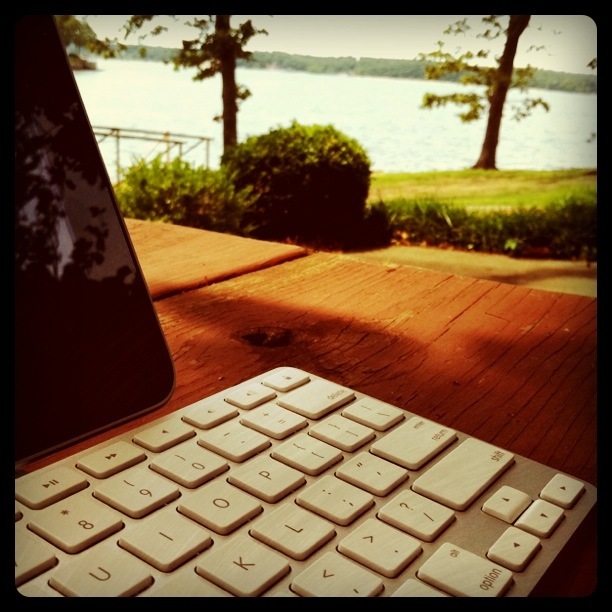 To blog or not to blog on vacation? Wonderful! May Ms. Deep sink into the inspiration at Glen East. Ms. Practical is probably more comfortable manning the office, licking envelopes and shuffling papers. She’ll appreciate your focus when you come back more productive than ever. Oh, my yes. Ms. Practical is such a intense shrew sometimes. I know that Ms. Deep isn’t waiting without working, if I know her at all, she is harvesting and lining up the words already. So that when the boss goes on vacay, the fun will happen. And in a “practical” note, I find the end of the school year weeks to be incredibly demanding, and I’m just the mom! There’s something about summer that keeps Ms. Practical in her place, I think. Might I say I’m so jealous you’re going to Glen East! It looks like an incredible workshop, plus you’ll get to spend time with Katie Gibson. Can’t wait to hear all about it! Love it. I’m picturing sock puppets. Ann, thanks for the encouragement! I imagine I’ll feel much more balanced a month from now. Jen, you’re absolutely right about the end of the school year business. When my kids AND my clients have so much going on all in the same month, it’s a bit much. I know I just have to ride it out, but wow, it’s tough. HopefulLeigh, I’m SO excited about Glen East, between hanging out with Katie and giving myself (Ms. Deep, rather) the time and focus to think and write. I will definitely be telling you all about it! Addie, that’s hilarious. So I guess one sock puppet is poking at me from one shoulder, and the other is whispering in my ear from my other shoulder, right?